(No. 4 in the November 2015 FIDE Warld Rankins). 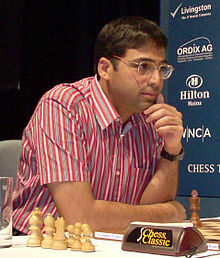 Viswanathan "Vishy" Anand (born 11 December 1969) is an Indian chess Grandmaster an umwhile Warld Chess Champion. ↑ "Sport : Anand inspires mind champions". The Hindu. Chennai, India. 22 December 2007. Retrieved 31 May 2010. This page wis last eeditit on 13 Januar 2017, at 22:25.